Portable weather stations offer versatility and mobility, unlike any other weather station type. There are industrial applications for these devices’ accurate on-site weather readings. They are also widely used by outdoor enthusiasts, bikers, and researchers. However, selecting the best portable weather station might be a tricky business. There are more than a few available models and their prices can come very close to some high-end full-size weather stations. To point you in the right direction, I’ve made a selection of the top portable weather stations for a range of needs and budget. What Is a Portable Weather Station? As the name suggests, portable weather stations are weather measuring devices that can be deployed in the field. There are a few different types including tripod or car-mounted and small handheld weather stations. For the purposes of this write-up, I will stick to the handheld models since they are by far the most popular. In addition, handheld weather stations are not wanting of measuring features, which brings them one step closer to their full-sized counterparts. They usually measure temperature, wind speed and direction, humidity, UV index, and a few other parameters. What to Consider When Buying a Portable Weather Station? Like all other types of weather station, there is a certain set of desirable features that you should look for in portable weather stations. Handheld weather stations tend to look like a slim multimeter except for the built-in anemometer. But those who wish to take the station on an outdoor adventure and expose it to challenging weather conditions would benefit from some extra protection. Some of the models featured here have a protective jackknife design for when the station is not in use. If the unit doesn’t come with its own carrying case, you can always store it in somewhere safe while you’re in the field. Durability and build quality may vary significantly. Top-of-the-line models would naturally feature ironclad waterproofing and even military-grade impact protection. But you can’t go wrong if you get a reasonably priced unit with a protective case. Most handheld portable weather stations give accurate temperature, wind speed, humidity, and altitude measurements. There are also models which offer compass, dew point, and barometric pressure readings. It shouldn’t be a problem for you to find a unit that fits your specific needs. 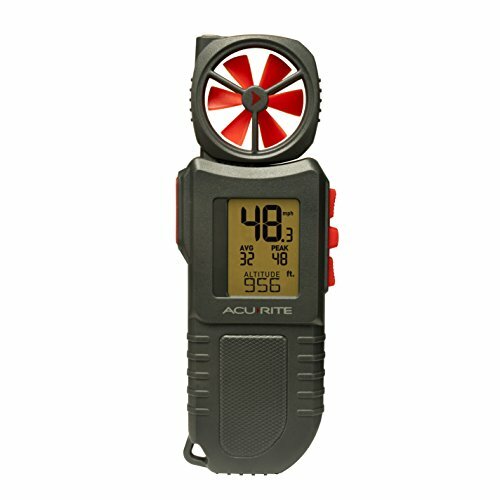 Those looking for a budget-friendly portable weather station should surely consider the AcuRite 00256M. The unit comes with a set of great features for an entry-level model and is capable of precise temperature, altitude, wind speed and chill, humidity, and heat index measurements. Another neat feature is the extendable anemometer which can be pulled out for more accurate wind velocity readings. 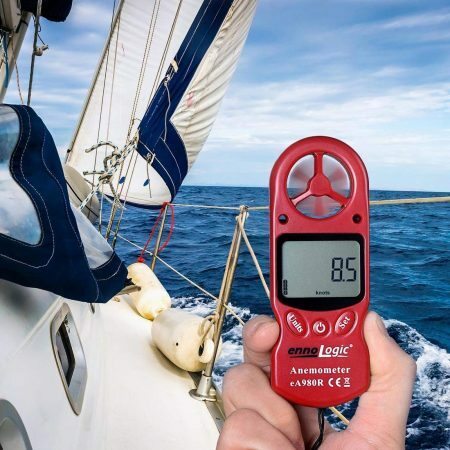 The wind speed updates every second, altitude every 5 seconds, and temperature every 30 seconds. The AcuRite also comes with a rather large backlit LCD screen (for a handheld model) that features all of the vital weather information. The unit is powered by 3 AAA batteries that don’t come with the package. This portable weather station is also ergonomically designed and sits really well in the hand with all the buttons within easy reach. The Ambient Weather WM-4 is one of the most comprehensive compact weather stations. First off, it gives users precise temperature, wind direction and speed, humidity, and wind chill readings. On top of that, the WM-4 can calculate dew point, temperature difference, and dry and wet bulb temperatures. If you need a portable weather station with a built-in compass, this Ambient Weather is one to consider. In addition, there is no need to worry about the integrity of the unit since it sports a jackknife case for some added protection. The case also prevents false temperature readings by eliminating temperature transfer while taking measurements. 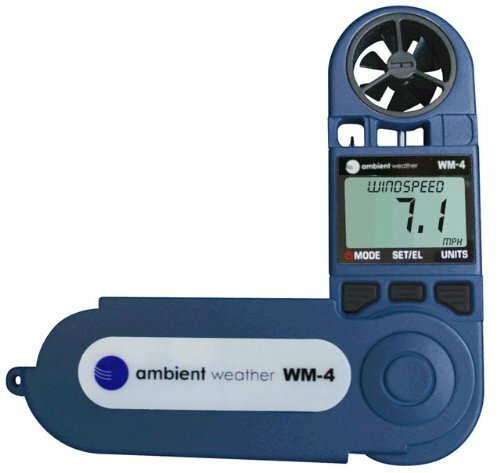 It is worth noting that the WM-4 features precise Swiss-made impeller and humidity sensor. This portable weather station is no slouch in terms of response times either. The wind measurement interval is around one second. Judging by its features, the Kestrel 2500 is perhaps the best portable weather station you can currently find. This weather station sports an extremely durable military-grade case. It is also waterproof and comes with a protective cover for safekeeping when not in use. 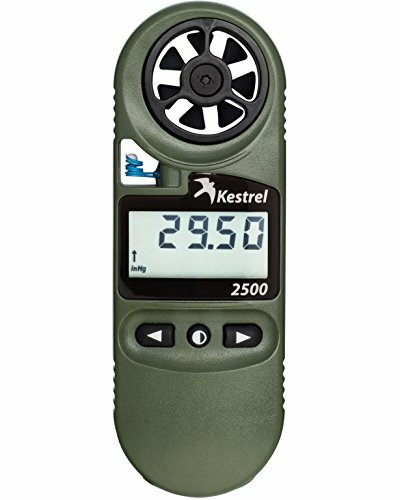 The Kestrel 2500 offers precise temperature, barometric pressure, altitude, and wind chill data. It is worth noting that it comes with a rather large replaceable impeller and exceptionally responsive temperature sensor (for a handheld device). This weather station only requires a CR2032 battery. Another high point of the Kestrel is its versatility. It is equally suitable for demanding outdoorsmen, educational purposes, and industrial facility management. 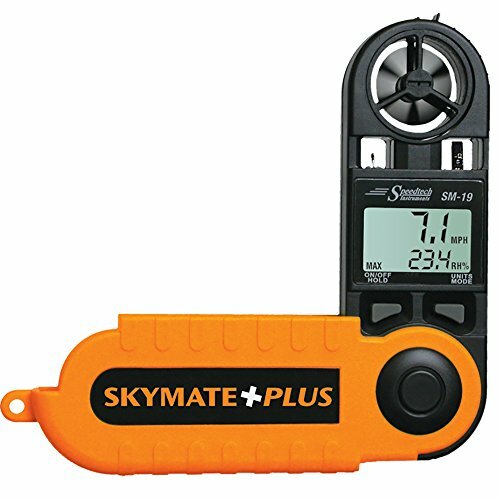 The WeatherHawk SM-19 SkyMate features great measuring capabilities and a jackknife case for extra protection. What’s more, the unit is reasonably priced. When it comes to measurements, the SM-19 SkyMate records temperature and wind speed. In addition, a precision hygrometer is responsible for accurate dew point and relative humidity measurements. The device also estimates wind chill and displays the average, current, and maximum wind speed. This unit is primarily designed for forestry and agriculture professionals. However, it should also be suitable for outdoor enthusiasts like fishermen, hunters, hikers, etc. 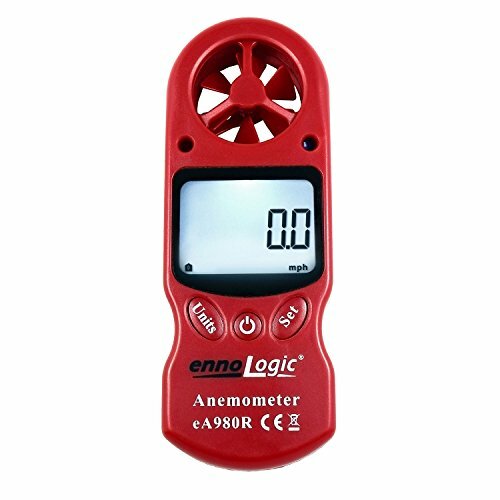 Besides having an excellent anemometer, the ennoLogic eA980R records the temperature, wind chill, humidity, and barometric pressure. In addition, this budget portable weather station measures altitude, dew point, and heat index, which puts it among the most well-rounded portable units. Another feature that’s in favor of this unit is the small form factor. It is pocket-sized and the 4.3 x 1.8 x 0.8-inch dimensions make it one of the smallest devices in this write-up. The eA980R also comes with a few extras including an LIR2032 battery, carrying case, and lanyard. On top of that, this pocket weather station is very easy to use. Once you get the device, install the battery and then press the power button, and you’re ready to thrust the anemometer into the air. The unit will start displaying the measurements almost instantly. Portable weather stations are useful for a variety of people who enjoy the great outdoors or need an onsite measuring device. The above options are all excellent but the Kestrel 2500 may just be the best portable station. The device features premium build quality, measuring capabilities, and waterproofing at a level that’s beyond most portable weather stations.